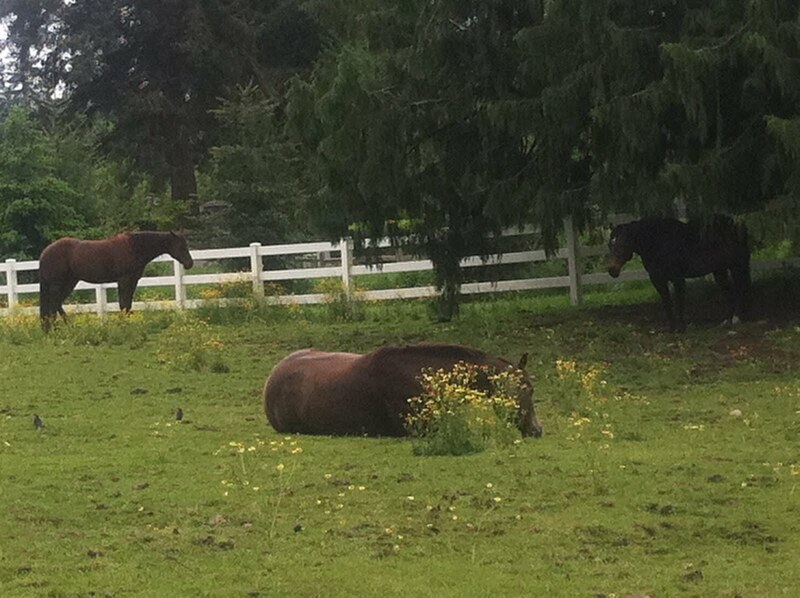 in their pasture at Blue Heron Ranch. Laura Hubbard, resting during a break at at Blue Heron Ranch. 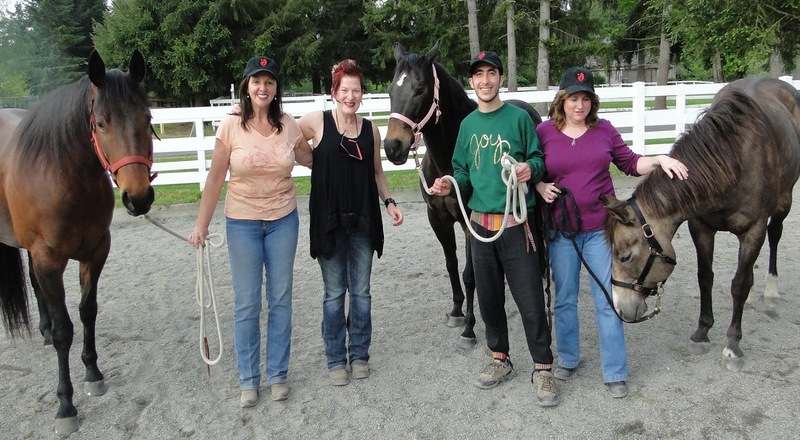 created by Nia Faculty Trainer and equestrian educator, Randee Fox is for everybody (8 years and above). Nia & horses education teaches you to explore sensation in order to connect to your body and move in harmony with a well-trained, gentle horse partner while deepening and sharpening self-awareness, character development and leadership skills. No Nia or horse experience necessary. Nia & horses education is designed to foster sensory connection through Nia’s Body’s Way principles by way of the human-horse bond. The Body’s Way principles teach that the body is coded to keep us aware and safe. Sensory information feeds that awareness. · Heighten sensory awareness through physical connection to body, environment and others. · Develop physical relaxation and presence skills. · Cultivate increased sense of natural rhythm and timing. · Boost physical conditioning and stamina by learning to access, consciously self initiate and energetically balance and flow sensations of flexibility, agility, mobility, stability and strength. · Increase physical self-carriage, personal confidence and magnetism. · Break through feelings of self-doubt, hesitation, and ambivalence and transform personal energy into definitive, expeditious, positive action. · Enhance ability to physically sense and express compassion. · Fortify creativity and pleasure in body and life through dance, touch, movement and interactive play. · Fine tune teamwork, collaboration and both non-verbal and verbal communication skills. · Integrate ability to sense, move and consciously direct attention and personal energy. · Learn how to carry physical centeredness in a variety of situations while maintaining safe boundaries and transmitting inner authority. Students learn to sharpen their energetic communication, using exercises based first in choosing to tune into physical sensation then practicing and sharpening energetic communication skills, based in safe horse handling. These exercises and skills are first guided and practiced on one’s own, in groups of people, then with a well-trained horse on the ground. The first step in gaining leadership is to be ‘present in our body, through sensation’. Then safety and communications skills are taught. We start with physical grounding through sensation and learn communication skills understandable to a horse with non-verbal physical expression or ‘body language’. 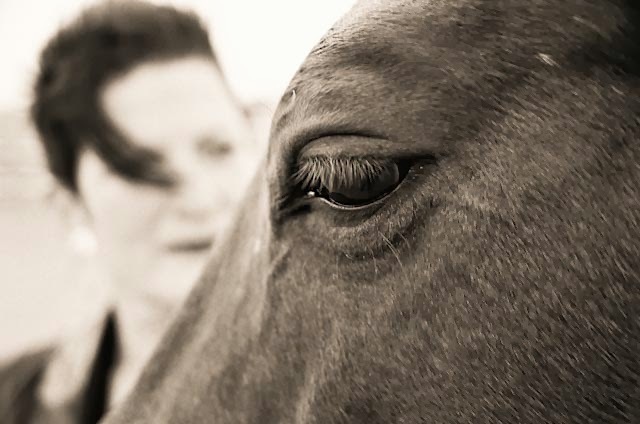 The trained horse senses our centeredness and confidence and can mirror back by their willingness to connect, be with us and move with us. Establishing safe horse handling and strong leadership skills will help create a harmonious relationship. The trained horse will accept leadership and move with us as strong leaders. This is where the dance begins. When we are centered and present in our body’s ‘sensation’, relaxed and confident, we are more able to be with and move with the horse. This is how connection happens - with us as centered leaders. They are magnetically drawn to our leadership, which allows them to relax and enjoy our company. Over time, they remember us and begin to trust us as their strong leaders. This is where the true relating happens and how a ‘harmonious relationship’, with us as leaders, is created. Many of Nia's principles are applicable and synchronous to movement with horses, enhancing sensory IQ, physical awareness, body language and energetic communication with horses. enjoying White Belt Principle 1, The Joy of Movement with a horse. 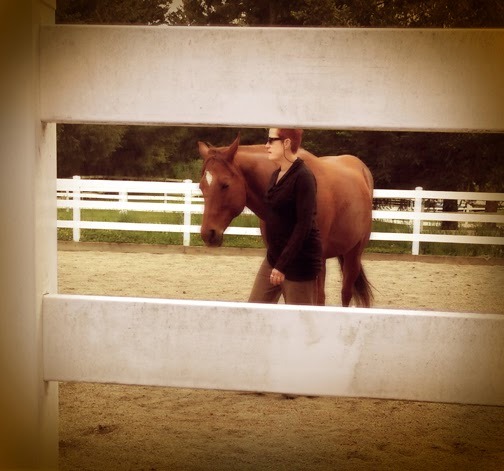 Because it is in a horse’s nature to ‘mirror’ our movement and energy bodies, their feedback can inform us of our leadership qualities, teaching styles and ability to connect to our own sensations moment-to-moment. Nia and Horses® Special Application Training will give you new tools to greater self awareness, movement habits and how you present yourself as a leader in the world. If you are wanting to deepen your Nia practice or are an active equestrian or equestrian educator, Nia and horses program will open opportunities for you to create a more finely-tuned sense of aesthetic, rhythm by offering a wide range of physical, expressive movement and musical enhancement tools. 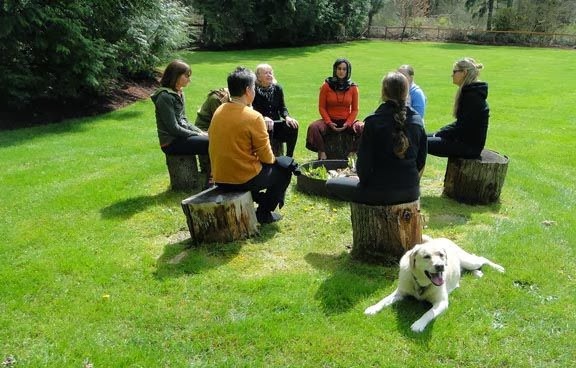 Participants 'creating the space' together outside on the ranch with the ranch's dog, Lil'Ley. This is a ritual that is taught during the White Belt Training, done twice daily. It is a time for stillness, a time to give honor to ourselves, our classmates, our teacher, the space and the practice of Nia, helping us settle and remove all distractions. 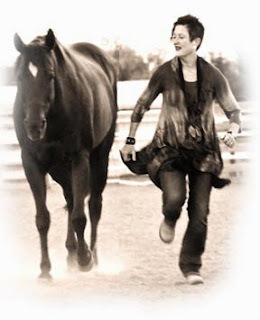 Nia and horses also offers opportunities for you to somatically connect more deeply your nature, your ‘animal self’. 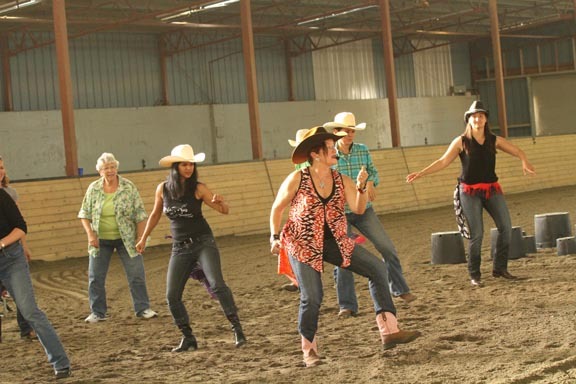 Sessions are taken in a beautiful light-filled 1,500 square foot dance studio, in the horse arena with horses, on wooded trails, under trees, and on hillsides with soft beds of grass while experiencing your body’s nature in nature. It is fun, filled with adventure, discovery and surprise. Blue Heron Ranch Studio is an inspirational movement space with sprung wood floors, high ceilings, surrounded by nature, horse pastures and filled with light.